(News from DSQVN in Indonesia) – December 23 at the international airport Soekarno-Hatta (Jakarta), Indonesia’s Ambassador to Vietnam Hoang Anh Tuan and Embassy officials have held off Vietnam 42 fishermen are behind Indonesia this batch returned home. This is also the phase greatest return last fishermen in 2015. In the time near Christmas and New Year holiday season, your bodies are very busy. Therefore, the return of 42 fishermen this time is the result of both efforts Embassy to bring more and more fishermen return home to reunite with family in traditional Lunar New Year is approaching. 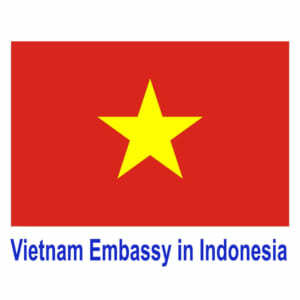 Representing the fishermen were returned to the country this session, Mr. Tran Thanh Phuong, Binh Dinh descent, was moved to express thanks to the interest and enthusiasm of the staff the Embassy of Vietnam in Indonesia for our fishermen during arrest and detention in Indonesia. 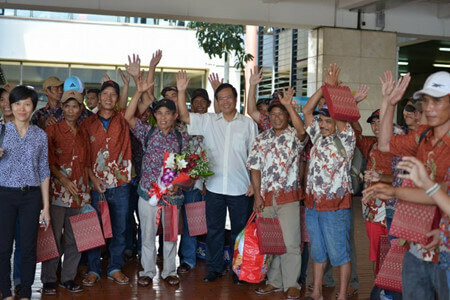 During his stay in Indonesia, Vietnam fishermen are treated kindly Indonesian and humanitarian. Anh Phuong also said he and the brothers themselves fishermen very touching to see the Embassy has cooperated effectively with the Indonesian authorities to protect and bring Vietnam fishermen on the water the shortest time. The detained fishermen said saw his wrongdoing when fishing in the exclusive economic zones of Indonesia, and promised not to recidivism after returning home. Ambassador Hoang Anh Tuan has graciously visited, chat with fishermen and share feelings glad to have up to 42 fishermen of Vietnam are Indonesia returned home on this occasion. To achieve results, the Ambassador also mentioned the enthusiastic collaboration, closely and effectively between the Embassy and the Indonesian authorities, as well as the movement of the Embassy to the fishermen I enjoy your clemency policy on the occasion of the upcoming Tet. Ambassador eager fishermen continue to maintain the spirit of solidarity, always well observed laws of Vietnam and yours, especially not to repeat fishing in Indonesian waters.